You’ve grown up thinking that Robin Hood was a dashing, handsome young man in green. But what if he was really a she? Robin of Locksley is a headstrong young woman who is struggling to find her place in a male-dominated society when her father announces that she is to be married to the Sheriff of Nottingham. Unable to accept this fate, Robin rebels and tries to flee to the safety of London to seek aid from the King. Along the way she encounters deadly adventures and familiar characters and begins to make a life for herself among the trees of Sherwood Forest. Robin chooses to disguise herself as a boy and keeps isolated from the world until she rescues a young boy being beaten by the Sheriff’s soldiers. This incident marks the beginning of her role as leader of outlaws – soon to be known as “Robin’s Merry Men”. Robin’s endeavors to provide an honorable life for her people while, of course, stealing from the rich and giving to the poor make her beloved of the people, but enrage the Sheriff of Nottingham. 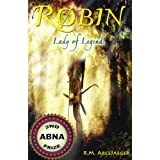 She and her band are continually hunted by the Sheriff and his men, especially when she steals yet another prize from his grasp.Full of adventure and danger, bowmanship and daring robberies, companionship and romance, Robin: Lady of Legend is the exhilarating tale of the girl who became Robin Hood. Sissy: I was actually IN the bathtub when I began reading this book. Bubby: My eyes! My eyes! Scrub that mental image! Sissy: No time for your pathetic body jealousy, Bubby. Anyway, I got so caught up in this tale that I became positively pruney! I really liked this twist on an old tale. I loved that it had a strong female protagonist who didn’t give up her femininity but could still thrash the boys with her stunning archery skills. Bubby: I am all for the strong, beautiful girls as lead characters. I remember when I was growing up, the only girls that had leading roles in books were either wimpy victims or evil hags. Sissy: Are you referring to Evil Aunt Hilda’s diary? Bubby: No, but I could be! Man, she was a piece of work, wasn’t she? But to get back on topic, I am so glad that today’s books offer some better role models. Plus, they are much more interesting to read! I was so impressed with Robin’s decision to take her life into her own hands rather than marry that stinky sheriff. This was just a great read all the way around. Action, romance, it had it all! Sissy: O.K. so you meet all the familiar characters from the original Robin Hood tale and it’s fun to see how the author introduces and develops each one. In the historic tale, Robin and Maid Marian have a beautiful romance. This incarnation of the story also has romance and at the beginning you wonder who the female Robin Hood will fall in love with and what will happen to her sister Maid Marian. The results are truly satisfying. Since this is not a spoiler, I shall not tell you who ends up fancying whom. Sissy: How insensitive of you to suggest Friar Tuck as Robin’s romantic interest! I am as offended as if you had said the Pope or the Dalai Lama! Bubby: Hey, Friar Tuck renounced the authority of the Sheriff. Maybe he had renounced his vows too! You don’t know! Anyway, it’s not like I was offering him as a serious possibility! Sissy: What literary abyss have you fallen into with your overactive use of exclamation points today? (Bubby is typing my parts today while I dictate). Bubby: I always type. Cause you’re computer illiterate, remember? Sissy: As always, I shall ignore Bubby’s petulance and continue my review. Bubby: Wow. Did you eat a thesaurus for lunch or what? Sissy: As I was saying, R.M. Arcejaeger cleverly weaves well-known characters and scenes from the original Robin Hood with new twists and turns and plots. I give it 4 bubbles. Bubby: I really enjoy retellings of classic stories. This is my new favorite in that genre. I just noticed that this author has another book out – a retelling of Cinderella. That is going to the top of my must-read-next list. Robin: Lady of Legend gets 4 bubbles from me too. Pingback: Lady of Legend – A Hilarious Bubble-Bath Review!